It was the end of last year when I found out that Betrayal by Harold Pinter – the Nobel Prize for Literature 2005, one of my favorite playwrights – would have been represented in London from March till June 2019, also starring Tom Hiddleston, the talented and famous theater and cinema actor (one of my favorites too). Two loves, one big opportunity: how could I have missed it? So I had the privilege of crossing the threshold of the Harold Pinter Theater, flying from Rome to London a few days ago. 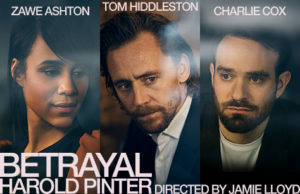 Betrayal (1978), whose remarkable cast includes also Zawe Ashton and Charlie Cox, is a bitter, touching, moving tragi-comedy with points for irony. The mini-drama chronological order covers several years starting from 1977 and going back to 1968. Rather than in the political and social terms of his other works, in this play Pinter proposes a reflection on the “human drama” showing the “lie of love” in a single act of an hour and a half without interval (as per his own indication) and the “betrayal” concerning: marriage, friendship, aspirations, expectations and life plans. Pinter let the audience “spy”, as from the famous “keyhole”, on the relational dynamics between the three forty-year-old characters – the spouses Robert and Emma, and Robert’s best friend Jerry -, showing the deterioration in relationships and mutual love through essential, pressing and sometimes unsettling dialogues, with a touch of the typically British gentle humor. Emma: Tell me something … have you ever thought about changing your life? Jerry: Change my life? (pause) Impossible. 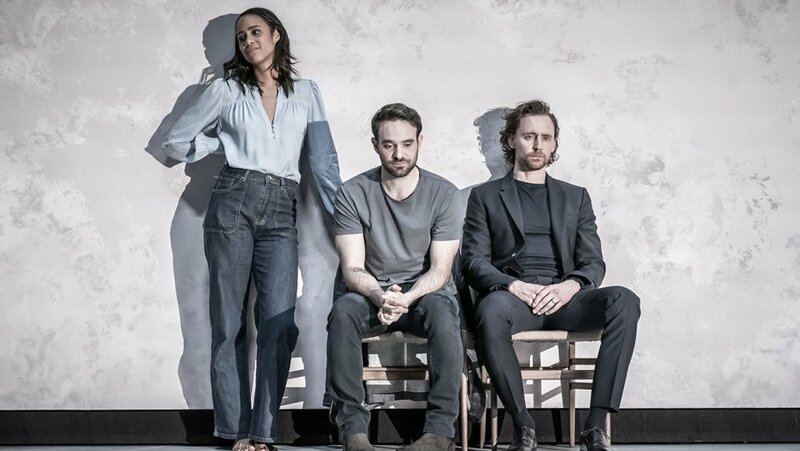 Jamie Lloyd’s direction is excellent, as the neutral, sober and functional staging, including a central turntable, a movable back wall and few props. It’s the actors who “draw” the space with their movements and their constant physical, verbal and spiritual presence, with all their silences, looks, tears, hesitations and eloquent pauses. “It is in silence that, for me, the characters acquire a greater presence,” said Pinter significantly. Ninety minutes (which pass too quickly) of emotions given by the powerful plot and by the three magnificent actors with their brilliant acting and intense interpretation: we laugh, we cry, we hold our breath with them. We empathize with the characters, as when Robert, seated, holds his little daughter in his arms trying to make her sleep while the betrayal of his two dearest people consumes behind his back. An unforgettable experience that didn’t disappoint my expectations.